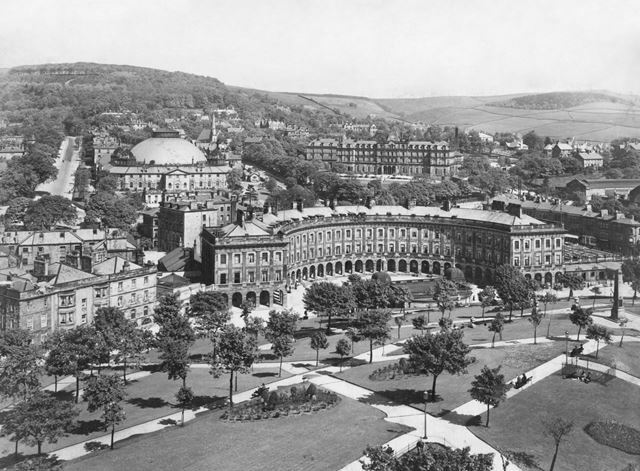 Townscape including The Crescent, Buxton, c 1930. This photograph shows the Slopes, formerly known as St Ann's Cliff, in the foreground. Wyatville is said to have laid out these gardens facing the Crescent. In c 1845 by Joseph Paxton, the sixth Duke's confidant and gardener, modified these gardens and created the Serpentine Walks in the Pavilion Gardens. 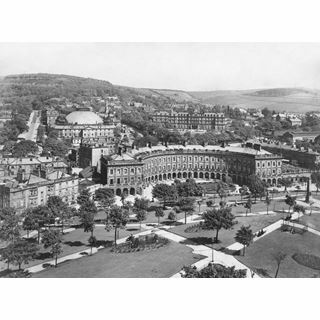 The photograph shows The Crescent, the Devonshire Royal Hospital, and the Palace Hotel beyond. The Crescent, consciously modelled on that of Bath, was built for the Duke between 1780 and 1784 by John Carr, out of locally quarried gritstone, and included a ballroom and an Assembly Room as well as a town house for the Duke and shops along the ground floor. It displays a magnificent face that is 240 feet in length and bears the coat of arms of the Duke of Devonshire at its centre. The eastern end of the building, contains an entrance to the Crescent Hotel and the old thermal baths which were built in 1854 and now houses the modern Cavendish shopping arcade. The Crescent is a Grade 1 Listed Building, which currently has proposed plans for its restoration. In 1785-90, John Carr built the Great Stables for The Crescent, to houses 100 horses. Later, in 1859, the Great Stables were converted into the Devonshire Royal Hospital, 'for the use of the sick poor'. 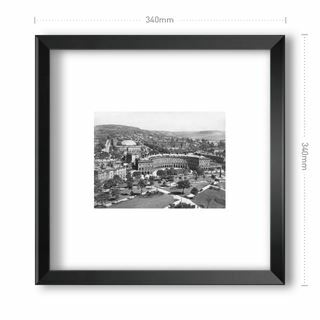 In 1881 Robert Rippon Duke designed one of the most notable architectural pieces of the town - a huge slate dome to cover the central courtyard. The dome weighs 560 tons and spans 145 feet. 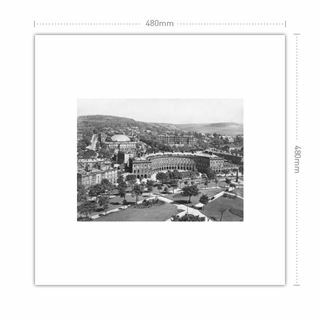 At the time it was the largest unsupported dome in the world, and to this day is still the largest of its kind in the country. The building closed as a hospital in 2001, and is now owned by the University of Derby. The Palace Hotel was built in c 1868 by H Currey, who also constructed the Natural and Thermal Baths and the Pump Room. 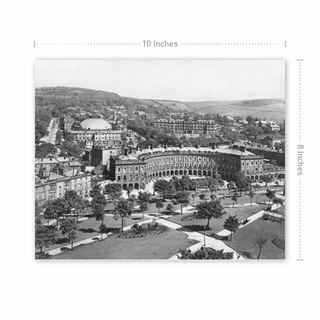 It served the many visitors to Buxton Spa, and is situated near to the railway station for their convenience. The hotel closed in c 1970, but was re-opened and later renovated in 1996.